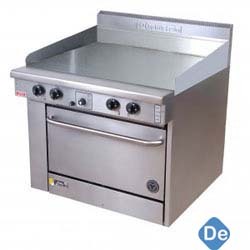 Electric/Gas Griddle Plate with Oven Manufacturer/Supplier in Delhi, Electric/Gas Griddle Plate with Oven in Delhi. Due to our state-of-the-art production unit and the usage of sophisticated machines, we are competent to offer an inclusive variety of Griddle Plate with Oven. Keeping in mind existing market trends, these products are developed by our knowledgeable professionals employing supreme quality raw material and up to date tools. Further, our quality team checks these products on well defined industry parameters.